Having a well-shaved hair isn’t as easy as it may sound. Achieving the perfect shave has always been a challenge for men who like to groom themselves well. If you are in need of shaving your head at home, then you need to master this art very well. Occasionally, most people cut their head hairs in barber shops. The problem is if you suddenly change your barber, you are going to have one hell of a haircut. Most people commonly refer it to as cheating on your barber. That always never ends well. Although shaving is an activity that is mostly undertaken by men, women also do shave their hair once in a while. I remember I once read an article where women were giving reasons why they cut their hair. I laughed at some of the reasons that I found to be petty. One lady said that she cut her hair after getting into a heated argument with her brother. I just can’t understand why I would cut my hair just because I differed with someone. For men, shaving is a normal grooming act. It helps you maintain a clean scalp because at no point will a well-shaven head be dirty. This is however debatable. But if you always take a shower before and after a long day at work then you can rest assured that your shaved head will always be clean. Arguably all men fear to get bald. The loss of head hair personally freaks me out. Sometimes I do try to imagine how I would look if I was to wake up one day with a bald head. Those thoughts do scare me a lot. Men who have premature baldness shave often. This is mainly attributed to the fact that the hair on the side and back of your head grows faster than at the top. So consistent shaving ensures that the hair size is the same and their baldness is not easily noticeable. There is also a notion that when you have a bald head, you may not be the go-to guy for some ladies. Since every man wants confidence, then trimming your head hair always can serve as a morale booster. Shaving the head can also be viewed as a fashion statement too. Sometimes you might find men with long beards prefer to have their heads always shaved. To some extent, it can boost their general outlook. Personally am not a beard person so this will not work for me. The products I have reviewed below have some similar features but they do also differ in some way. This chart will help you compare what you get from each of them and help you in picking the ideal one. Remington is a company that has been existence for quite a while. This shows that whatever products that they make are of good quality. Otherwise, the company would have closed a long time ago since it is rare for a company whose products are not well accepted, to continue manufacturing. Most skin care products whether processed or assembled should perform as expected and Remington takes that into account when launching new products on the market. They incorporate intricate concepts in some of their flagship products and this makes these devices stand out from the ones already on the crowded market. This shaver has an ergonomic design that ensures that it fits perfectly into your hands. This allows you to easily reach the back of your head, neckline and around your ears. You will always feel that you are in control when using this device. The shaver’s blade is made from stainless steel. This makes them rust free. The blades are sharp enough and can be used to cut even the thickest hair. The blades are known to reduce pulling and snagging that comes as a result of using a blunt shaver. The complete package has 9 length combs, cuts 1/16 -5/18 inches allowing you to achieve the perfect look like you always want. The motor is driven by a durable lithium battery that is rechargeable when depleted. On a single full charge, the device will give you up to 40 minutes of continuous shaving. It also charges fast and is cordless. This makes using it easy since no cables will get in your way as you shave. 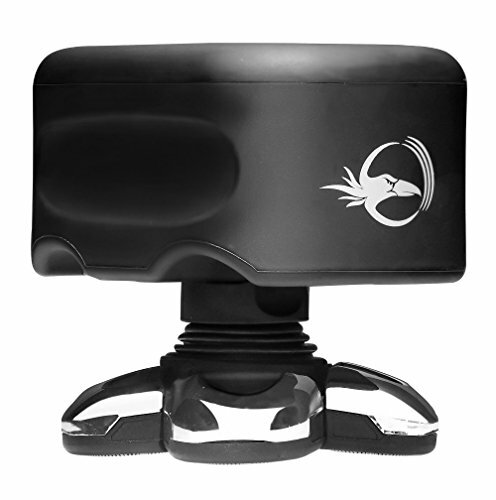 The package also has a Shortcut Pro Hair Clipper that you can cord maximum for improved versatility and convenience. Other parts that are included are a cleaning brush, shaving oil, a charging port may sometimes be included, and a safety pouch for on-the-go storage. – The travel pouch is good for storage. – Stainless steel allows it to be washable easily under the faucet. – Extra wide blades contours with your head for improved coverage. – The Pro Hair clippers are 100% washable. – The total run time tends to be lower. – The miniature size can be difficult to handle especially by people with long fingers. I am not bluffing about the features on this shaver. All the attributes stated above do actually exist on this shaver. All you need to do is make an order for this fantastic Remington shaver and improve your shaving experience. Before buying any shaver for your head, you should always ask yourself whether the product that you have chosen is just another shaver or among the best. There has been an influx of shavers on the market today. Picking the right one can be a challenge. But with this Skull Shaver, you will get that perfect cut that you desire. We are not saying that this will be the only shaver that you should buy. But it can be a great acquisition to your line of skin care products. The package’s trimmer attachment is for reducing long hair before going for the close shave. However, if you want to use this product immediately you remove it out of the box, then you need to trim your hair to a considerable height prior to using it. This skull electric shaver features rotary blades. Rotary blades are best suited for head shaves. This unit has five blades that move individually and are mounted on a large head. This head flexes and swirls to follow the contour of the head. After you done using it, you will be mesmerized by the good results that you will have. The shaving head allows for a one-time spot shaving ensuring that you don’t have to go over an area many times, a habit that can cause nicks and skin irritation. The shaver has a small patented base, unlike its predecessors that used the traditional long handle. The small size allows it to fit comfortably in the palm of your hand to ensure that you are always in control. Recent releases of this product are waterproof hence can be used in the shower and cleaned under the faucet. This device comes already charged allowing you to use it immediately you remove it out of the box. After the power runs out, all you need is to plug it into a socket and in two hours you will get a full charge. – Flexible, comfortable and easy to use. – The latest generation of this product is waterproof. This product has been on sale for a while now. The company has had a chance to alter the different features of the shaver so as to make it a reliable product. The last model manufactured acts as a prototype for the next build. These incremental improvements result in the company having arguably the best electric shaver for head today. Most men that use head shavers will agree that the shorter the blade the longer the time you will take to complete your cut. This is mainly attributed to the fact that for a shaver with small blades, hair constantly gets stuck and you will be forced to remove the hair manually. This can be a dangerous thing to do since some shaver blades are so sharp that you risk nicking your fingers. This shaver from Wahl’s line of professional shaving product solves all these. For years the company has invested a lot in research so as to understand the market requirements. Having a prior knowledge of what most users expect from a good blade will result in a company designing a product that can meet almost all of the market requirements. There is no all-round shaver on the market at the moment. All that companies do is to make a product that can be universal to some extent. 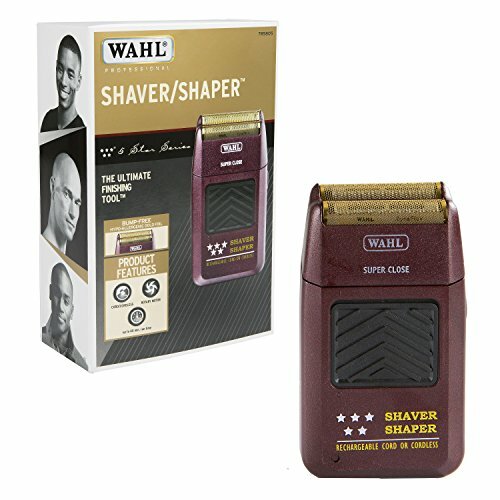 That is where this Wahl product beats most of the other products hands down. This is however still debatable since there are some jobs that the device cannot handle. Wahl is well known for making professional products and it does not fall short of what most users expect from it. Most of their products have a 5-star rating and are intended for professional use. Having said that, let me take you through some of its features that are key selling points. This shaver not only offers an appealing appearance but also top notch cutting precision. It comes with a rechargeable NI-CAD battery. The battery is responsible for the running of the motor and operates at 120v/60Hz. On a single full charge, you can get up to 60 minutes of shave time. But ask yourself again, do you really need to shave your head for a whole hour? No. By the time you are done with a single full cut, you will probably have drained the battery by around 50%. The head of the shaver has a hypoallergic gold foil, a feature that ensures that the product is ideal even for the most sensitive skin. This feature makes your shave free of razor bumps and you will not have aftershave irritation. The blade also cuts with maximum precision leaving no ingrown hair. For your convenience, there are other accessories included in the package that will play a key role in ensuring that you have the perfect shave. There is a foil guard that protects the gold cutting edge from getting into contact with hard surfaces that can damage the cutting edge. A handy charging plug will give you a quick full charge when the device is plugged into an AC/DC power source. There are cleaning brushes included and special instructions on how to operate it. The 60 minute run time is ideal for an average shave. The gold foil gets damaged easily if not well protected. The funny thing is that most people rarely read these manuals. On most occasions, you just the get the shaver out the box and begin using it. You will only go back to the manual when you are unable to do some operation with your device. You should try as much as you can to always read the manual before using the device. All Wahl’s professional products are only purchased from an authorized dealer. They have a manufacturer’s warranty which you will not get from an unauthorized dealer. If the warranty is missing just know you are about to be scammed. Headblade has for long been a front in making niche products for the market. The company has done a lot of research to understand the market requirements. Having a good grasp of what your customers expect from you will result in the development a product that meets almost all their requirements. This shaver is an award-winning product that has a top rating. One outstanding feature about it is its handle design. This might actually be the main feature that makes it the go-to product. Its design will just leave you impressed and increases your urge to want to experience how it performs. 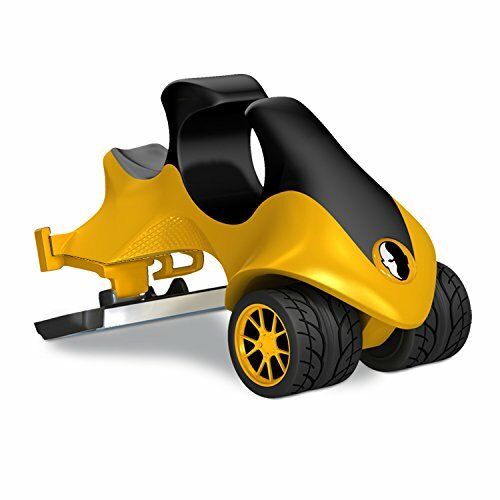 This product follows in the footsteps of its predecessor, the Headblade Sport. It improves on this by adding a better design and styling. So we can as well say that were it not for the sporty model, the ATX All-Terrain Header would not have been one of the best. It mainly builds on the design concepts of the sporty version and tries to address the challenges that the earlier one faced. Ideally, this is one of Headblade’s most selling shaver that has few equals. The shaver has a sturdy construction with a classy look. You will be surprised as soon as you open the package. Its design makes it feel smoother and sturdier than most razors would feel. It will definitely impress you when you are using it in the bathroom. It comes with a standard 1-HB4 blade. The blade will give you among the closest shaves that you can get. Its design makes the blade to be compatible with the HB6 version hence you always have a second option just in case the blade needs to be replaced and you can’t find the HB4 version. It Uses new multi-blade technology that has a flawless design. Can also be used to shave legs and face. More efficient than its predecessors. This razor was introduced in 2012 and was in development for more than 3 years. It is similar to the MOTO version with the difference being that this one does not pivot laterally and has a rigid body. Most products from Wahl have a professional build quality that cannot be matched to any. 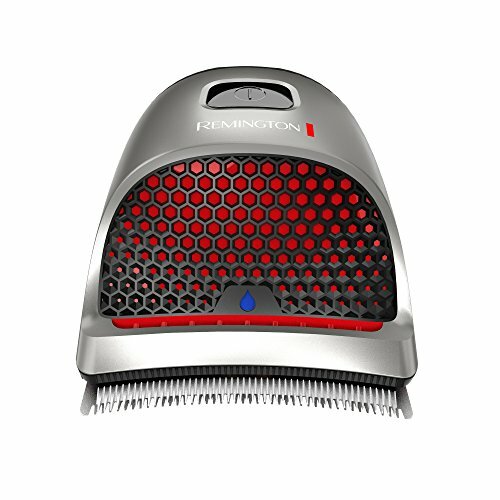 This balding clipper looks just like the conventional shaver that you will get in a barber shop. It has a maroon shade but can also be found in different colors. I know that using a shaver with a cord is something most of you don’t like. But trust me, on this one, you will never go wrong. The device gives professional cuts. It has a 5-star rating and this makes this professional clipper perfect for anyone who wants to have a good cut. It has been designed to ensure that it delivers sharp performance that most experts want in an electric shaver. It uses a powerful electromagnetic motor that cuts with twice the speed of pivot motors. This is what makes it a favorite among barbers since it gives stylists a surgically close cut and performs best when the user wants to shave in different styles. The package has other accessories included. There are two attachment combs, oil to ensure that it is well lubricated, and a cleaning brush for removing hair that gets stuck between the blades. There are also special instructions that most people don’t actually read unless they encounter a problem when using the device. A red blade guard will ensure that your blade is well protected from any abrasion. It is stylish yet functional. The complete package comes with extra accessories. The cord is chemical resistant. The long cord can easily get in your way. Does not have an ergonomic design hence difficult when making complex cuts. Cannot be used in the bathroom because it will short. This corded hair clipper is barbershop’s go-to product. Its design allows it to be used best for shaving other people rather than having personal shaves in the bathroom. What do you need to look for in a good electric shaver for the head? It is important that you have a clue of what you want to achieve and what you expect your electric shaver for head to be. This prevents you from buying products that you actually don’t need. Here are some of the things to look at. Pros and cons: The razor approach will get you the closest shave but it is cumbersome in achieving good results while an electric shaver is easier to use and has less chance of nicking. Budget: You obviously can’t buy a product that you cannot afford. Always find one easily fits into your budget. Versatility: Some head shavers can be used to shave beards, legs, and even arms. The choice will depend on the type of haircut that you are performing. These are shavers that are powered by either charging their batteries or using them while they are plugged to a power source. They are products that have been designed to be used on your head making a perfect shave. There are motors inside them that give these blades their powerful cutting action. You can shave your head using electric razors. Though some people might find this weird. You will definitely shave some hair if you decide to use these beard shaving products. The only problem is the quality of the shave might not be good as you want. Most electric razors on the market use spinning blades to cut coarse hairs tightly to the skin. They have guards that will protect your skin from the moving blades. Although electric razors can cut hair, they are not the go-to devices that you would want to use. All the above products have a good quality build. The Headblade ATX All-Terrain head razor is one that I recommend that you buy. It gives close shaves and considering its cost, you realize that you are actually getting more than what you pay for. All these electric shavers for the head are among the best that you can find on the market. Stop wasting your money on other less reliable ones and get yourself any of these quality products.